My Watermark is the Atlantic Ocean on Bimini Island. I first learned to fish as a child with my maternal grandfather during my school break visits to Bimini Island from Grand Bahama Island. I clearly remember how he would joyfully package up the fish and conch that he caught, for each of his children, but it was really for his grandchildren. He was an artisan, and an excellent boatbuilder. 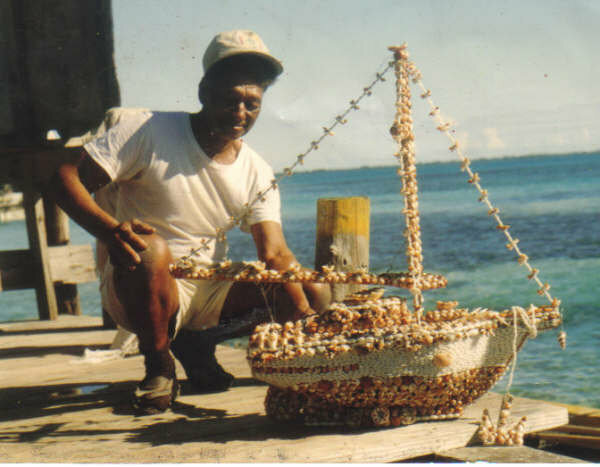 I remember watching him building boats, either for exhibits or showpieces or actual dinghies for sailing the Bimini waters. Bimini’s forest areas are the perfect habitats for the best wood quality for boat building. He had a deep connection with the water, and it was my time with him where I learned from someone who showed immeasurable love and respect for the water. That was important, even if at the time I did not realize it, that he was showing me how to be passionate about the sea and how to have an appreciation for the water. The time on the water was relaxing, yet breath-taking, I became captivated by the world under the sea. Those experiences directed my path. So, from then I believe that I was building my story to wanting to give others the opportunity to connect with the water. Subconsciously that knowledge that he had shared with me is exemplified in the way that I work passionately towards developing opportunities for my children or the students participating in our program to embrace the beauty and richness of the life that exists near, under or around the water. One of the challenges in the Bahamas is that there are no environmental protection laws. Further, environmental issues are not focused topics in schools, so students are missing opportunities to gain a full appreciation for the mangroves, coral reefs, pine forests or other ecosystems. So, our work gets a bit tough as we are also trying to encourage someone to sign a petition to advocate for environmental protection when they have no connection to nature or the water. There is a great deal of work that needs to be done to rework the curriculum for future generations to have opportunities. Resources to provide swimming classes to all, children and adults, are limited on a few of the populated islands of The Bahamas. And, many of them are afraid of the water because they are not able to swim. So, with recreational fishing or boating as major pastimes and a huge part of our culture it is frightening to know that many persons engage in these activities not knowing how to swim. For the others, although they are surrounded by the water, they will not go beyond dipping their feet into the water. Waterkeepers Bahamas has made it a mandate to provide opportunities for constituents of its watershed to have access to swimming classes for all ages. We incorporate walks and free time on the beach, which helps to get them used to the idea of going into the water and having fun around the water. I find myself lucky. It’s amazing to have a career doing what you love and being able to provide opportunities for others to embrace nature around us. I would like to see a future where 75% of all primary and secondary students are able to swim. I would like to see a future where careers are influenced more by sustainability and environmental sciences. A future where people are sensitive to the changes of nature, and have positive experiences connecting with the water. After all, humans are two-thirds water, the earth is two-thirds water, life is two-thirds water.